On January 22, 2019 Kenneth Kerr MacMillan passed away at 88 years old. He was the loving and much-loved husband of Hilda (nee Peters) for sixty-three years. They raised three children: Ali, Kim, Leanne (Bill); and have 5 grandchildren: Dexter, Kaleb (Kamiko) and Bridget MacMillan & Brenna and Tess Willette; and 2 great-grandchildren: Porter and Makena MacMillan. 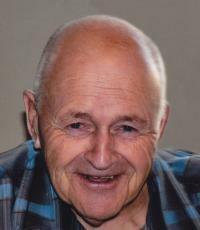 Ken felt that a person needed one good friend and his was Ivan Dillabaugh. They met in grade one and remained close friends for 82 years. Ken was the last of the children of Elsie and P.D MacMillan of Coleville Saskatchewan. He was the much loved and spoiled little brother to Arthur, Isabel, Marie, Philip, George and Louise. He was raised Presbyterian and later joined the United Church. Ken was a shy, kind-hearted, and hard-working man of few words with sky blue eyes and a handsome grin. He loved a cutthroat game of cards and a glass of rum while he bbq'd. Ken did many jobs in his lifetime; railroad, heavy hauler truck driver, farmer, and carpenter. His carpentry leaves a legacy in many homes in Coleville and surrounding area. In his later years he discovered wood carving and enjoyed it immensely. Ken & Hilda farmed 4 miles 'due west of Coleville', retired to Turtle Lake and then moved to St. Albert, AB. Although in his last years he battled dementia, it was not who he was and not how we will remember him. The family gives their sincere thanks for the wonderful care he received first at the Youville Home then at the Citadel Care Centre in St. Albert. The respectful care he received in his last days at the Citadel will not be forgotten. Ken would have rather roofed on a hot day over building outside in the cold. Out of respect for this, a Celebration of Life will take place on Saturday, May 4, 2019, at 1:00 p.m. at the Coleville Legion, 2nd Avenue, Coleville, SK. Interment will follow at 3:30 p.m. at the Coleville Cemetery. The MacMillan family wants you to wear whatever is most comfortable for yourself. Tartan welcome! As the hardest thing for Ken to lose was his eyesight, donations can be made to The Foundation Fighting Blindness Canada at ffb.ca or 1-800-461-3331 in his memory.